How To Keep Yourself From Receiving "The Mark of the Beast"
Anyone that’s been around religion for awhile has undoubtedly heard the term “mark of the beast”. It comes from a scripture in the infamous book of Revelation that states “all, both small and great, rich and poor, free and bound” receive the mark of the dragon “in their right hand, or in their foreheads” (Revelation 13:16). The scripture also says that no one will be free of the mark. Scary stuff huh? The beast is a representation of the evil in the world. It is driven about and inspired by the dragon. The dragon is Satan…whom has also been referred to as “The Serpent”. So in all actuality, the beast is the one that carries out all of the dragon’s dirty work. The beast is out recruiting as many people as it can, and once it’s placed his mark upon someone, it considers them property of the dragon. Still…the question remains…how does he go about placing his mark upon someones right hand and forehead. To better understand what’s really happening here, it’s good to dig into the word “mark” as it appears in the ancient texts. John the Revelator uses the Greek term charagma, “mark,” which denotes a stamp, etching, engraving, or impression. It also describes the brand a master places upon an animal or a slave. However, the word’s most important meaning denotes the “mark” left by “the serpents bite”. Think about it for a second. The “mark” is left from the “serpents bite”. When serpents bite you…what do they do? They inject poison right? 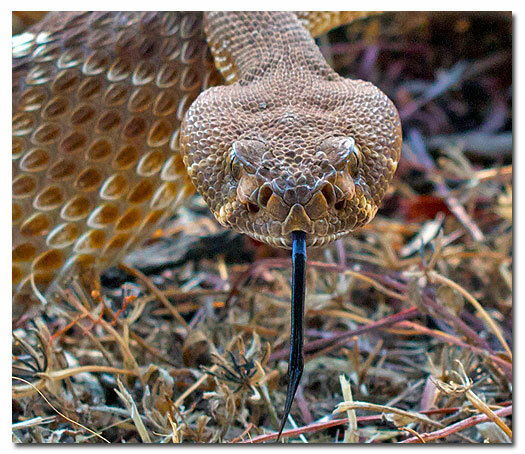 So the most poisonous serpent of all [Satan], sinks his subtle little teeth into you and then injects his poison. That poison starts to take control of your body…and where do you think it manifests itself? Thats right! Your right hand and your forehead. The front of your head or your forehead is a place that religious symbols have been placed for years. The forehead has represented a place that many show their allegiance to God or to Satan. It is representative of your thoughts…and we know that thoughts precede action. Your right hand…as is the rest of your body… is controlled by your thoughts. It has always been looked at as your symbolic covenant hand. It alone is a representation of your works. You use it to shake hands, to salute the flag, and to make covenants. If your mind has become poisoned through the “serpents bite”, you will no doubt begin to see the “mark of the beast” manifest itself in your actions. The spiritual poison begins to spread itself through the body after it has taken control of the mind [forehead] and the covenant hand [right hand]. At that point, a person has become one with the beast and their new master has become the devil and they have been branded a slave. All of this symbolism brings me back to the story of the brazen serpent in the Old Testament. The Israelites weren’t being very good little Israelites so the Lord figured he’d teach them a lesson. Little did we know, the apostle John would be teaching the same lesson centuries later through the imagery of the “mark of the beast”. The Lord sent some “fiery serpents” to bite the Israelites and then had Moses construct a bronze or “brazen” serpent to be hoisted up and placed atop a pole. The brazen serpent was symbolic of the Savior. He was trying to “seal them His” by giving them a Savior from the serpents. All the Israelites needed to do was look at the brazen serpent and they would live. If not, they would die slowly from the poison of the bad serpents. [It is interesting to note that the Israelites wouldn’t look because it seemed to be too easy…and also because they wanted to reject Moses as the prophet that was presenting the symbolic “Savior”. Their rejection of the prophet intrinsically caused them to reject the Savior in the process.] This happened to be a physical lesson with harsh consequences for the Israelites, but the mark of the beast is a much more important spiritual conquest by the most poisonous of spiritual serpents. He wants to bite you so that he can inject his poison and leave an eternal mark on you. There is only one way to escape the “mark of the beast”…and that is to receive the mark of God in our foreheads. Each of us have “sinned and come short of the glory of God” and have been infected to one degree or another. (Romans 3:23) If we will look to Christ… he can administer the only valid antidote there is for the serpents poison. After we have been cured by the Savior, we can receive the seal of God in our foreheads and have our thoughts directed at him. We have the opportunity to overcome the beast…but only in and through our willingness to look toward the Savior.